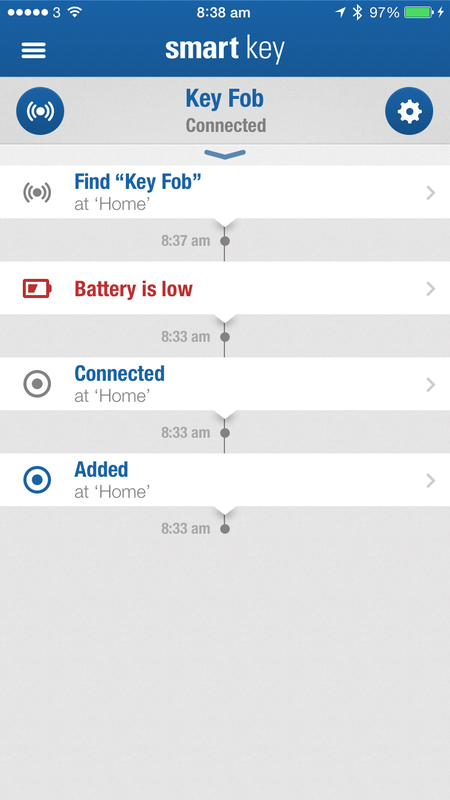 About eighteen months ago I saw an ad for Tile, a Bluetooth 4.0 Low Energy enabled tag that allows you to keep track of anything you attach the Tile to, with your smartphone. I was very tempted to try one but felt that it was let down by having a non-replaceable battery. It had a claimed battery life of twelve months but it felt like it was intended to maintain continued sales through replacement purchase of further units. I know just under $20 is hardly a fortune, but I decided it wasn’t for me. Since then I’ve seen a number of similar products hitting the market and, quite liking the concept, I’ve followed developments with interest. In mid December 2013 I received a newsletter from Elgato. 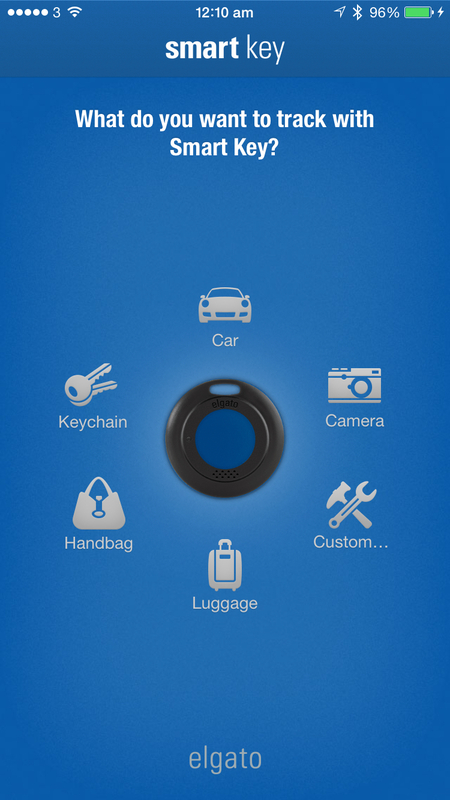 In it was featured their ‘Smart Key’. 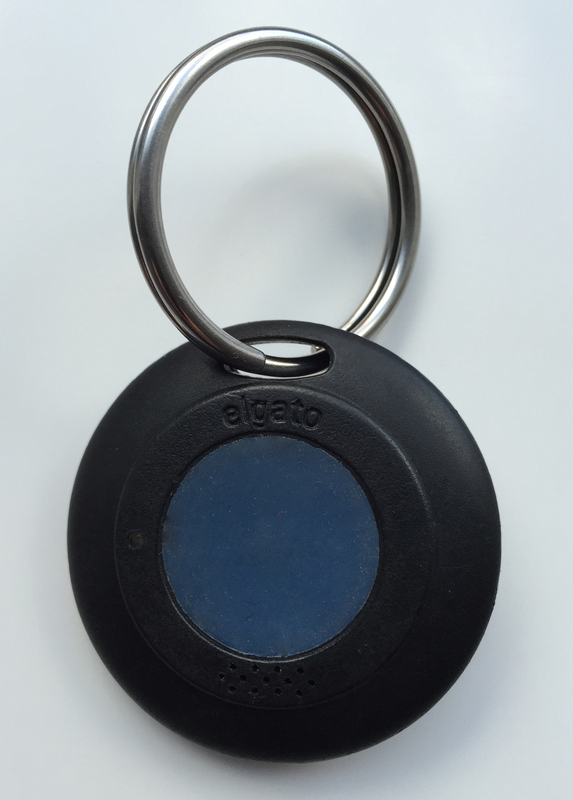 A Bluetooth LE enabled key fob with a replaceable CR2032 battery, that connects with dedicated app on a smartphone. I downloaded the app for iOS and played around with it in demo mode. I read a variety of mixed reviews. To be honest, most of the negative reports were from people who hadn't grasped the fact that it is not a GPS tracker, but a proximity device, limited by the active range of Bluetooth. Indeed all of the competing products are - whatever the marketing blurb may have you think. Tile even promotes the fact that your lost item can be traced by using the ‘Tile community’ which I would imagine is a bit hit and miss, as it relies on other Tile users coming within range of your lost Tile, and reporting the approximate location to you. I ordered the Elgato Smart Key and was initially impressed with it. The build quality is good, and it appears to be very durable. As it spends most of its time rattling around in a pocket, attached to a bunch of keys, it needs to be. 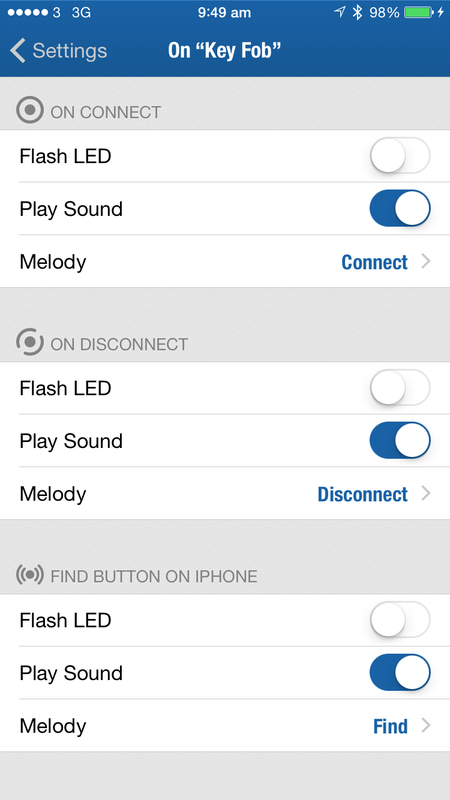 The setup process is simple and the iOS app intuitive. It has the facility to be set up in a variety of modes, depending on your needs. It soon became evident that the device is only as good as Bluetooth LE allows it to be. Connectivity isn't always great, resulting in the device unnecessarily moaning that it is lost, even when sometimes it is within inches of the phone it is paired with. I found myself simply turning it off, rather than put up with the annoying chirping at random intervals. 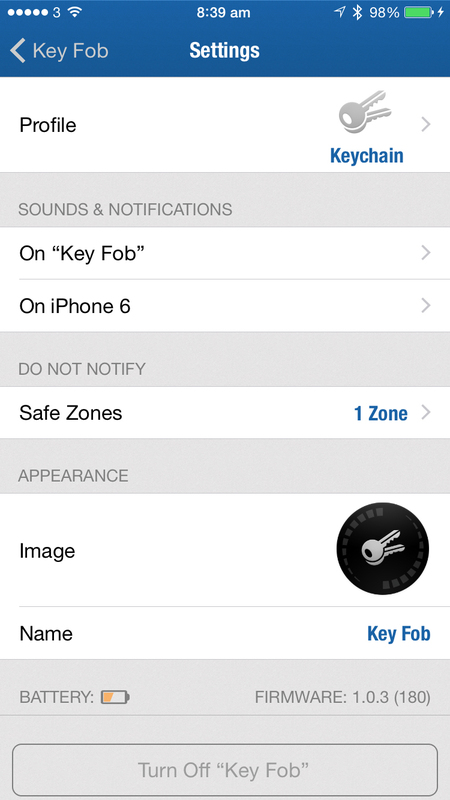 It has the facility to mark a location as safe, so you don't get notifications at home, for instance. Even this is far from reliable. When I bought the Smart Key, I had an iPhone 4S; I've since upgraded to an iPhone 6 and activated the Smart Key again, only to find exactly the same issues with reliability and inconsistent connectivity. 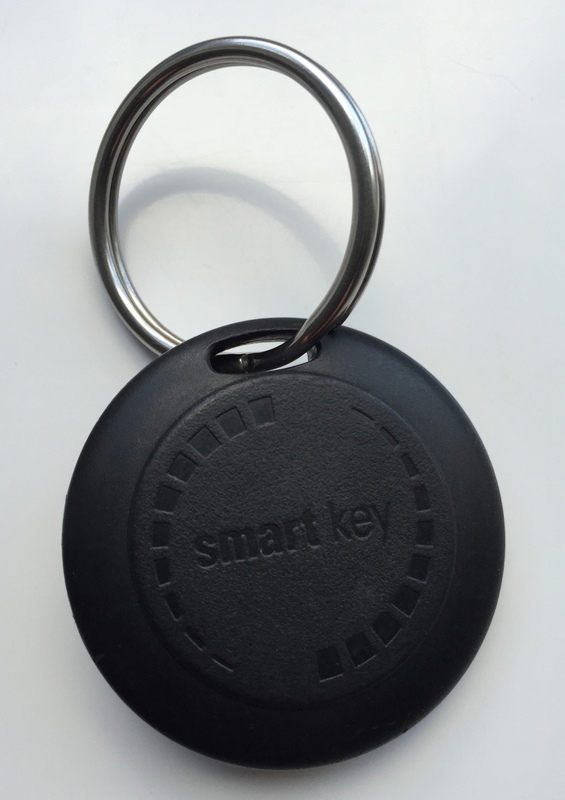 I really want to like the Smart Key, but something like this really needs to work flawlessly, and it doesn't. And so, it has hung from my key ring for almost twelve months, silent. I've not tried any of the competing devices, though I do use other categories of Bluetooth LE connected devices, and find them to be mostly stable and reliable. The Elgato Smart Key has a RRP of £39.95, and can be found for about £35. As is so often the case, particularly with technology products, the exchange rate between US $ and UK £ is 1:1. I feel that it is over priced and can only assume that a significant part of the price is contributing towards the development of the smartphone app. Possibly manufacturing runs have been quite small, further adding to the inflated unit price. The device and app are well designed - it's just a shame that reliable connectivity lets it down. 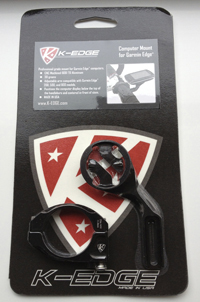 Review: K-Edge mount for Garmin Edge. A few months ago, after a significant amount of research and justification, I bought a Garmin Edge 800 cycle computer - a decision I have not regretted for a second. It's brilliant. I intend to write a more detailed post about it in the future. However, one down side I have encountered is to do with the mounting point on the bike. It is supplied with a plastic mount, secured with two elastic bands. Although the mount appears to be quite flimsy, it is actually very solid and secure when attached to the bike. The issue is that it is best secured to the handlebar stem, which puts the device in an awkward position for easy visibility whilst riding; it's just too far back, out of an easy line of sight, especially when descending at speed, or climbing, out of the saddle. It is possible to attach the mount to the handlebars, but that puts the device off centre, which doesn't look very neat, and still doesn't get it far enough forward. Resigned to this compromise, I was interested to see a post on Twitter, from a cycling contact, about the K-Edge mount for Garmin Edge. At that time it didn't appear to be available in the UK, and the proposed retail price was quite high. It did get very good reviews from a couple of cycle magazines and I put it on my non-urgent wish list. 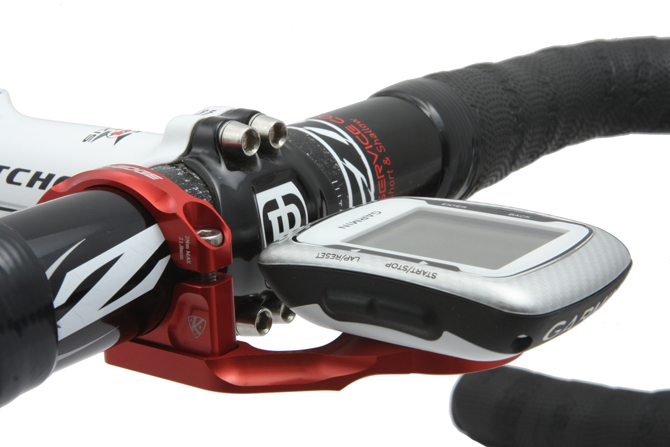 Since the introduction of the K-Edge mount, several other companies have launched alternatives, including Garmin themselves. Obviously the position problem is a serious enough issue for a lot of Garmin Edge users, to generate demand for a solution. My Twitter contact bought the Bar Fly and appears to be very happy with it. Both the Bar Fly and Garmin’s own Out-Front mount are made from tough plastic - the K-Edge is CNC machined 6061 T6 aluminium. The weights of all three are very similar and pretty insignificant, at under 30 grams. 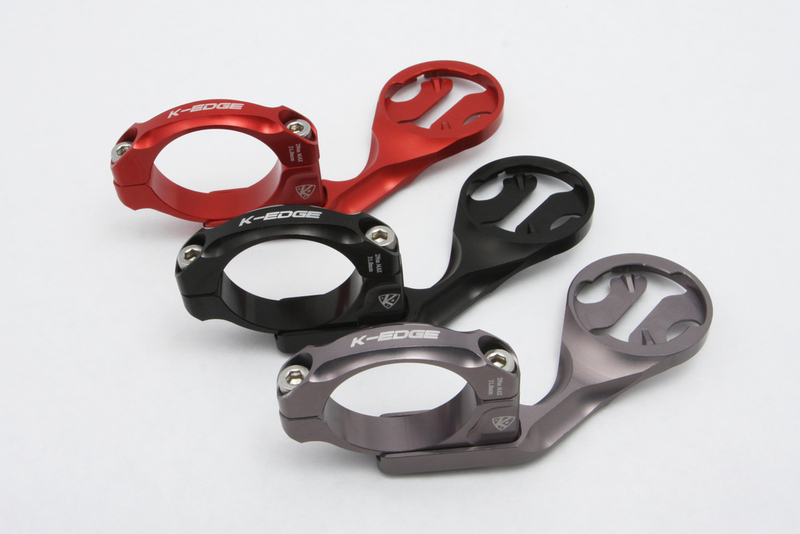 About a month ago, the K-Edge mount became available in the UK through online retailers. Stock was immediately snapped up and delivery dates were extended as the mount was put on back order. I then saw a video review on the excellent Scarletfire site, run by another Twitter contact. This re-sparked my interest in the K-Edge mount and I ordered one from Wiggle. Three weeks later, my mount arrived, and it's all I hoped it would be. It truly is a quality piece of kit. The design, machining and finish is excellent. It mounts easily and very firmly on standard, round profile handlebars. On smaller diameter bars some packing or modification may be required. No packing pieces are supplied, but I’m sure most keen cyclists will have a selection of different thicknesses from other bike mounts and accessories; or be able to make something from old inner tube. I’d heard reports that the disk lock part of the K-Edge was causing some people problems, shaving plastic off the base of the Garmin. Some have even resorted to filing the aluminium to slacken the fit. I’ve had no such problems. The fit is just right, with a positive click as the unit locks into position. The mounting head, which is compatible with the Garmin Edge 200, 500 and 800 units, is on a slider, locked in place with an Allen bolt. This gives a range of forward and backward adjustment to get whichever model of Garmin you have, in the perfect position. Shown with a Garmin Edge 500 attached. Since fitting the K-Edge mount, I've had only a couple of 50 mile rides, but within the first mile, the benefits were totally apparent. My only remaining question is, can I justify a K-Edge mount for each of my bikes? Well, with Christmas just around the corner, they're on my present list. I just hope that my close family read my blog. The three colour options available. I must thank Joe Savola at AceCo Sport Group, for kindly allowing me to use the product photographs of the K-Edge Mount for Garmin Edge. It's rare to be totally satisfied with something; especially when that something is a combination of product, customer service and efficiency. Like so many people these days, I carry around an expensive smartphone. I look after it, making sure that is kept away from pockets full of keys and change; ensuring that when I'm using it, I reduce the chance of dropping it onto concrete or asphalt to the absolute minimum. I keep it clean - polishing the glass, front and back, after almost every use. Then, I jump into my car and put it in a flimsy, light weight, poorly designed windscreen mount. It wobbles around in a ratchet adjustable cradle (the ratchet failed within weeks of buying it), on the end of a 9 inch (23cm) flexible arm that holds the phone in exactly the right position, except when driving on anything other than a perfectly smooth road. More often than not, it just bounces around, with at least half an inch (12mm) of travel in any direction. About fifteen months ago I was listening to the MacBreak Weekly podcast from Leo Laporte's TWiT network. At the end of each show, the contributors recommend a product, service or piece of software. On this particular edition, Andy Ihnatko talked about the trials of mounting tech in his car. His solution and recommendation was Ram Mount. Ram Mount produce an incredibly diverse range of products, designed to connect any device to pretty well any surface. You can create your own custom mount, by selecting the device holder, the mount and, if necessary, an extension arm from the vast catalogue of parts available. Late last week, my Kensington car mount failed completely. I was in my car and away from home. I loaded the Ram Mount site on my iPad and decided quite easily which mount and device holder I wanted, but I was struggling to find a suitable extension arm. I filled in and submitted a sales enquiry from the site, asking for help; explaining exactly what I needed. Within a couple of minutes, I had a reply, detailing the parts that I would need. I immediately set up an account and submitted my order. Confirmation came back within seconds, and within 15 minutes I got a notification email saying that my order had shipped. The following morning, my order arrived. I connected the three parts and attached the mount to my car windscreen. I can say without hesitation, that I regret buying all of the cheaper mounts over previous years. The Ram Mount is excellent. It is solid and stable. The suction cup is so much more substantial than anything I have used before and the X-Grip holder grips the iPhone easily yet securely. The extension arm is a two piece metal casting that clamps on to ball mounts on both the suction cup and phone holder, making precise positioning very easy, and once set and tightened, there is no movement of the whole assembly. I am totally satisfied with my Ram Mount experience. All Ram Mount products are covered by a lifetime warranty against defects in materials and workmanship. Ram Mount is an American company (National Products, Inc.), based in Seattle, WA. I bought from the website of Ram Mount UK.